Intuitive Eating can be a difficult process, especially in the beginning. 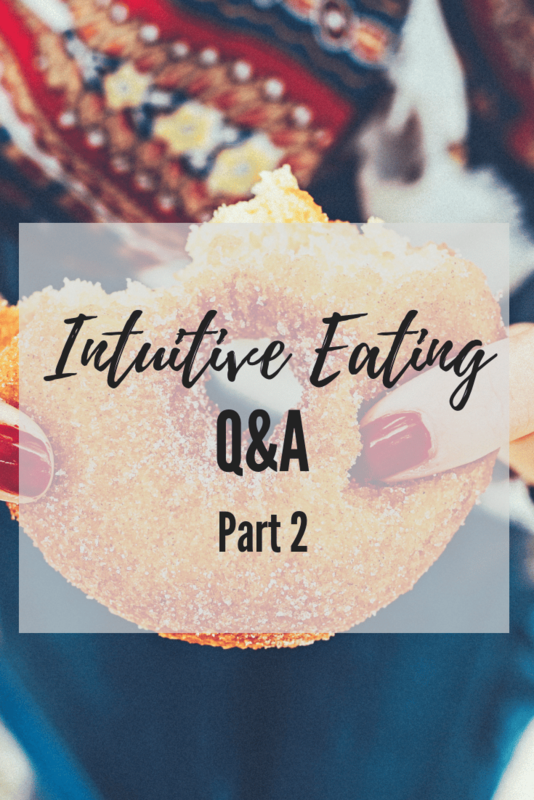 There have been a few questions that came through in my private Intuitive Eating and Body Image Support Facebook group (please join if you haven’t already!) that I want to address today. Read on for my answers and tips to help you during your Intuitive Eating journey. These questions and tips below cover weight loss, practicing Intuitive Eating with special health conditions and how to deal with guilt/shame. If you are new to Intuitive Eating, check out my blog post on how to get started. Stay tuned for more Q&A in the future and comment below with any questions you might have in your own Intuitive Eating journey. I really thought Intuitive Eating would result in weight loss for me (even though I know that’s not the point!). I guess I’m still ever ‘hopeful’ that weight loss might just happen spontaneously, so I’ve been surprised that my weight is the same. Think about being a caregiver for your body instead of needing to accept your body. Think about actionable steps that show your body that you care for it. Can you instead tell your body, “I can show you some compassion and kindness”? Behaviors towards your body change before thoughts/feelings towards your body. You can modify behaviors first, by taking actions towards caring for yourself. So, think about, “How can I be a caregiver to my body, hate it a little less, be less of a bully?” What are some ways this week that you can extend some self-compassion to yourself? Can you explain why emphasizing Intuitive Eating should be a priority? Is it just for people’s mental health, or because there is an actual measurable health outcome? So a weight focus not only doesn’t make us thinner or healthier, but it has many negative consequences. Meanwhile, Intuitive Eating has many positive health benefits both mentally and physically. This is why I choose to become and intuitive eating dietitian and practice from a weight-inclusive standpoint. I work really well with structure and I am able to count calories without feeling restricted. I eat what I want but I give myself a limit. I tried intuitive eating once and I didn’t like how I felt! I didn’t trust myself and after a week I just felt guiltier than I did before. Is it possible to diet successfully? Intuitive Eating takes time to fully work through. I always say it’s the opposite of a diet, where diets are easy at first – because you’re following structures and rules – and harder as time goes on; versus intuitive eating is really tough at the beginning but gets easier and easier until eventually, you don’t have to think about it at all. It sounds like the guilt and lack of trust made you feel uncomfortable. This feeling is completely normal when adding back in a wider variety of foods that you don’t regularly eat. It is normal for it to feel wrong to eat all foods, when you’re used to thinking of certain foods as good or bad (even if that’s subconscious) or used to thinking about things in terms of calories. Instead of running away from that uncomfortable feeling, and turning back to the “safe” and “comfortable” behaviors that you know, you have to be ok it being there and feeling this way for a little while. The length of time varies but usually takes at least a month or two, and often longer. Eventually, the uncomfortableness is replaced with a strong connection to your intuition and with that will come feelings of ease and relief, and no guilt. Eventually, you will not have to overthink your food decisions, it will come naturally and easily. 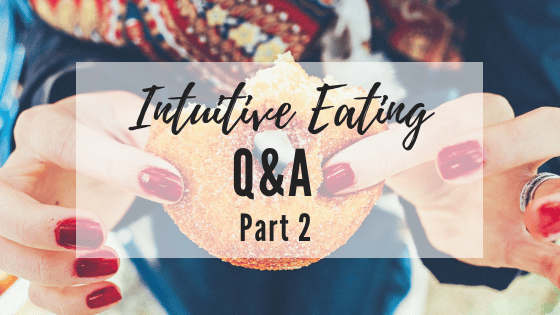 What other questions do you have about Intuitive Eating? Share in the comments below and I’ll answer them in future blog posts! I work with clients virtually throughout the US, helping people who are frustrated with dieting change their relationship with food and say goodbye to diets once and for all. You can also learn more about my intuitive eating nutrition coaching programs to see how you can find balance and develop long-term lifestyle habits, no diets required. When I was younger I was overweight and I was overeating. I think I got to a point later on when I was practicing intuitive eating, and my weight became lower at this point. Lately, I’ve found myself in a more restrictive mentality and working to return to intuitive eating. My question is, if I return to intuitive eating, am I going to be overweight like I was when I was overeating? Because I didn’t feel good then either. Hi Julie, it’s impossible to say what will happen to your weight – we really have very little control over it. Our body has a natural set point range of 10-20lbs that it works to keep us in. As you work on intuitive eating, some people find they initial gain some weight or lose some weight, but either way your body will eventually return to its natural set point, whatever that may be. I have been into eating everthing I want for four months now and I can feel the benefits of being more relaxed, less overeating and no more guilt or shame around food. But I noticed that my skin, which has always made me some worry, has become a bit worse during those months. I couldnt find anything about intuitive eating and skinhealth online or anywhere and would love to know more about it. Can my skin handle all the sugar and pizza and fries? Would love to hear from you and be very grateful for more information and insights on this topic. Hi, I have recently begun trying intuitive eating and am a little confused about the ‘making peace with food’ stage. Should I be eating previously forbidden foods past fullness at this stage, and only be considering fullness once I have truly made peace with food? Or should I be eating forbidden foods, but only to saiety? Thank you! Hi Jessica, great question! The main thing in this stage is to give yourself unconditional permission to eat – creating an environment where you can eat previously off-limits foods when you want to. If you shoot past fullness that is fine – think of each eating experience as a learning experience. Approach it with curiosity, instead of judgment. Let me know if this answers your question!